Though I run my own business, I consider myself an entrepreneur in the loosest sense of the term. Similarly, though I cook for people for money, I have a hard time owning the word chef. But the nice thing about being a young professional home cook trying to make it in the age of tech is that you get exposed to a lot of cook start-ups at the ground (beta) level. Earlier this month, I was approached by Mealku, a new food start-up that bills itself as a cooperative for home cooking. 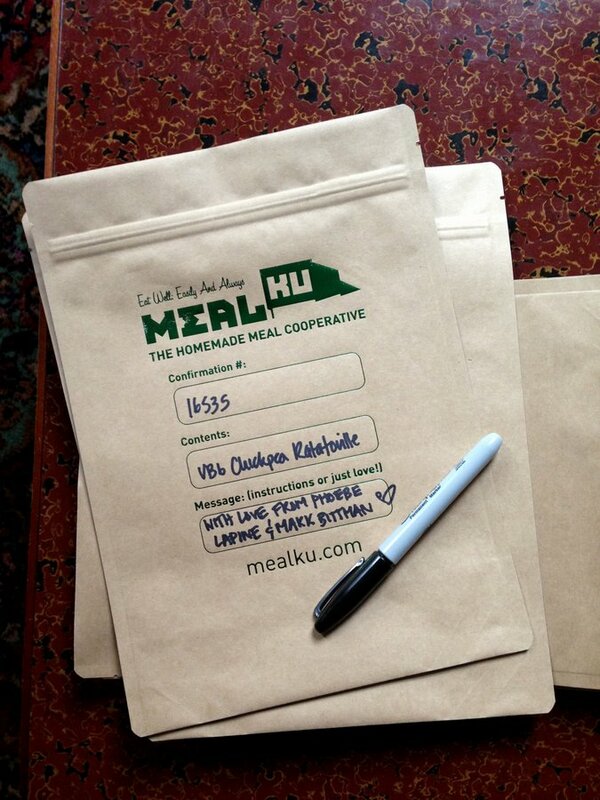 Members of the community can request various recipes to be cooked for them by Mealku chefs at a set price. The portions are packed away in insulated bags, picked up from the chef’s apartment, and dropped off on the consumer’s doorstep. It’s kind of like Seamless Web for home cooking. Since I’m such a big believer in home cooking as the main vehicle towards a healthier life, but am often times too lazy to do it for myself after a long day of cooking for others, I was very much into this mission. But what attracted me most to Mealku is that the chefs can also offer up extra portions of whatever they’re cooking to the community, which might have saved me from the week I gorged myself on homemade pad Thai, ten ways. I tested out the Mealku system last week as part of a promotion with Mark Bittman. 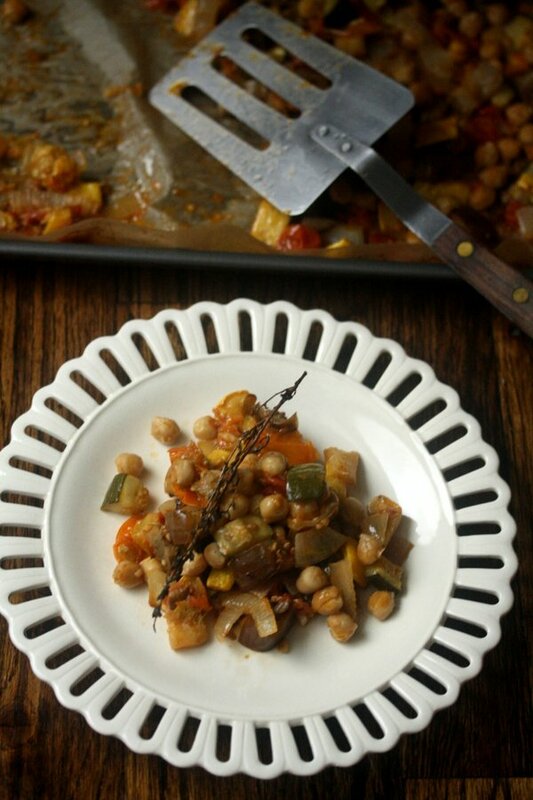 I made 16 portions of Chickpea Ratatouille from his book Vegan Before 6, and Mealku delivered it to various tastemakers throughout the city. Not only was it a delicious way for me to try my hand at a new recipe (which I’ve shared with you below). But it was a rare opportunity to share the output of my kitchen with fellow food writers and fans. This week I’m going to be testing some great fall recipes for this site. 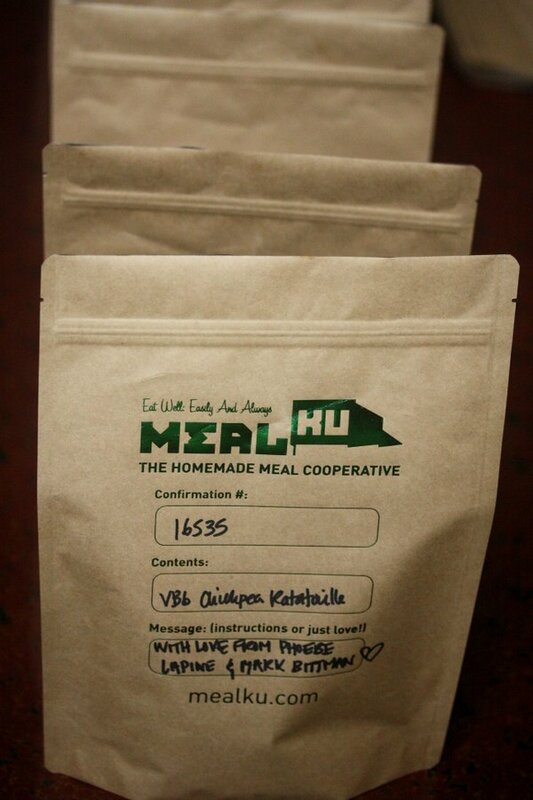 If you’re in the New York area and interested in tasting them, sign up for Mealku. I’ll make sure to also tweet and post on facebook when I’ve got meals up for grabs. 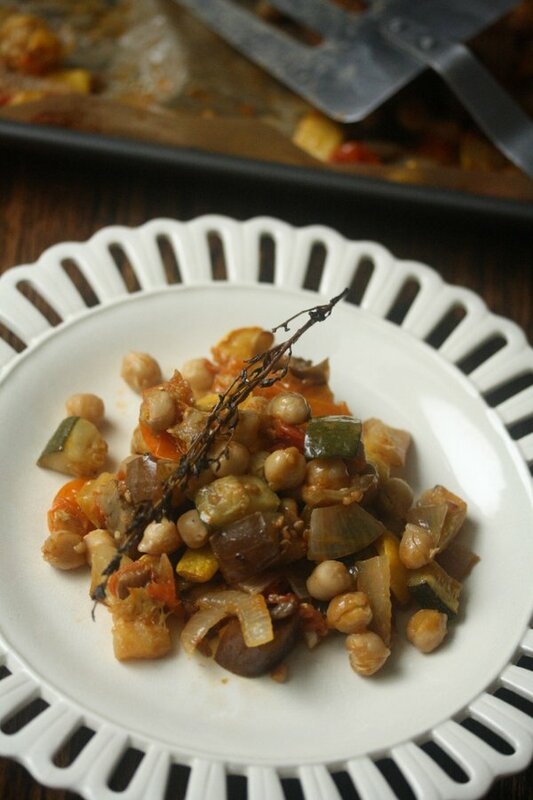 For the rest of you, I wanted to share my adaptation of Bittman’s Chickpea Ratatouille. 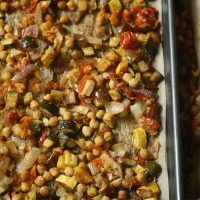 This roasted ratatouille is perfect for this time of year and incredibly easy to throw together as a healthy vegan weekday meal, before 6 or otherwise. Adapted from Mark Bittman's Vegan Before 6. Heat the oven to 425°F. 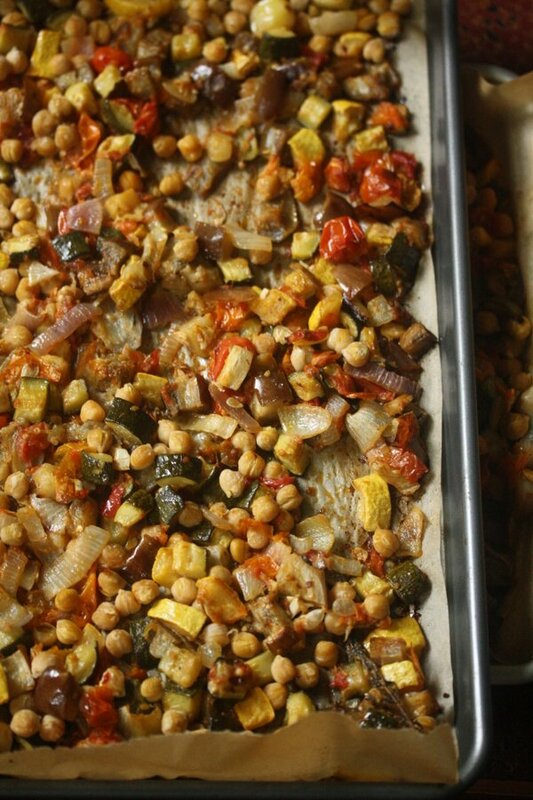 Combine the eggplant, zucchini, squash, tomatoes, onion, garlic, salt, and thyme in a large roasting pan. Drizzle with the oil and toss to combine. Transfer to the oven and roast, stirring occasionally, until the vegetables are lightly browned and tender and some water has released from the tomatoes to create a sauce, 30 to 40 minutes. 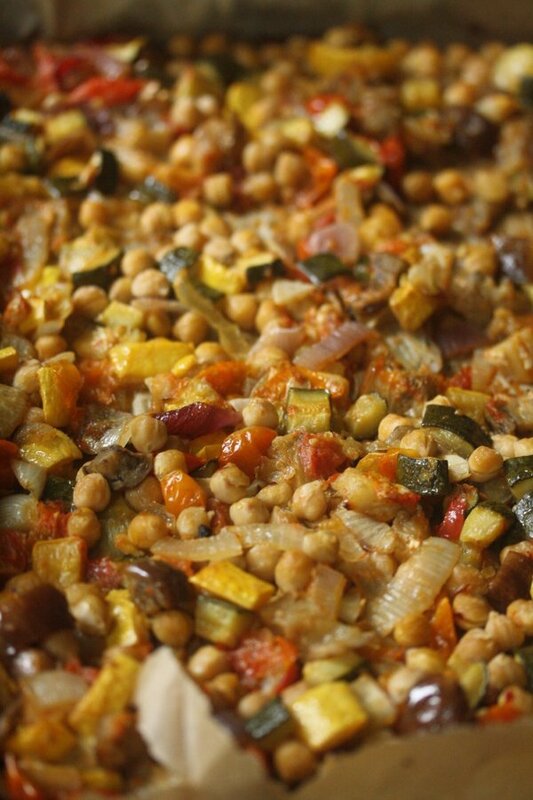 Add the chickpeas, stir, and return to the oven until the beans heat through, 5 to 10 minutes. Add the basil and stir. Taste and adjust the seasoning and serve hot, warm, or at room temperature. Such a great idea! Wish I was in the NYC area so I could join in the fun! And when shall I pencil-in MealKu’s arrival to Medellin? This recipe looks so homey and delicious…I guess I will just have to make it myself in the meantime! Your ratatouille looks exquisite, Phoebe! Thinking it would go fantastically well with the lentil burgers that are all the rage in Medellin. Would be a dream to have Mealku right now, as we have yet to receive our kitchenware and have been eating out almost every day. I cooked this tonight to have food to eat over the weekend. Just took a taste, and can’t wait to have it for a meal! I tweaked it a little to add red bell pepper, and used herbs de Provance. This is a perfect dish for my family, because I have one daughter who is vegan and one who is vegetarian. For non vegans you could easily add feta cheese, or use as a side dish for meat eaters.